Aluminum capper is a general category that includes all types of metal closure cappers. The uses of metal caps, or metal closures, have been reduced due to the advent of more sophisticated plastic closures, which can handle the increased pressure associated with carbonation in soft drinks. These new types of plastic closures are usually injection molded. (See Plastic / Injection Molding.) Aluminum cappers are designed to apply aluminum roll-on closures or to apply crown metal closures to a container. The metal caps are applied in a similar method as a plastic closure. Chucks designed into the aluminum capper grip the magnetic closure and screw the cap onto the top of the bottle. Metal closures are often used to close wine or distilled spirits bottle. Aluminum capper rated from 20 to 120 cpm – speeds depending on materials, application and machine configuration. Cap size range: 11mm to 28 mm. Equipped with stainless steel mesh conveyor, 12 pocket star wheel in-feed, vibratory hopper, stainless steel cladding and barrier guarding. Change parts required to accommodate size range. Automatic, single head, 12 pocket rotary, aluminum capper capable of speeds from 20 to 150 cpm – speeds depending on materials, application and machine configuration. Cap size range of: 13mm – 30mm. Container size range: 1/2" to 3" in Diameter; 1" to 5 1/2" in High. Equipped with a 70 " longby 3 " widw delron product conveyor, 12 pocket rotary star wheel, 18" diameter vibratory cap feeder bowl and E-stop. Mounted on stainless steel base frame. West Model PW500, aluminum capper rated from 24 to 120 containers per minute – depending on materials, application and number of pockets. Can run solid ROPP pilferproof aluminum caps. Cap size range: 11mm to 38mm, container size range: 21mm to 54mm diameter x 50mm to 190mm high, with proper change parts. Equipped with 34" long x 2-1/4" wide mesh belt container conveyor, turning disk cap hopper, 12 pocket rotary container handling wheel, and 3 spinning roller sealing head. Control panel has on / off, e-stop buttons and speed control dial. Mounted on (4) leg base frame with operator light. West Model PW500, aluminum capper rated from 24 to 120 containers per minute – depending on materials, application and number of pockets. Can run solid ROPP pilferproof aluminum caps. Cap size range: 11mm to 38mm, container size range: 21mm to 54mm diameter x 50mm to 190mm high, with proper change parts. Equipped with 70" long x 2-1/4" wide mesh belt container conveyor with no container / no cap sensor eye, turning disk cap hopper, 12 pocket rotary container handling wheel, and 3 spinning roller sealing head. Control panel has on / off, e-stop buttons, speed control dial and digital counter. Mounted on (4) leg base frame with operator light. West, Model PW500-F, automatic, aluminum cap sealer. Rated form 30 to 120 containers per minute – depending on materials, application and machine configuration. Cap size range: 11mm to 38mm. Container size range: 21mm to 54mm in Diameter x 51mm to 191mm in Height. Capable of running standard pilfer proof, lined serum, tear off / flip off closures, solid aluminum caps, as well as special closures (with proper change parts). Equipped with disc sorting cap hopper, 12 pocket rotary container handling wheel, (3) spinning roller sealing system, 48" long x 2" wide stainless steel mesh belt conveyor. Control panel with on / off switch, e-stop conveyor and bin speed control dials and product counter with readout. Mounted on (4) leg base with locking casters. Automatic, aluminum cap sealer rated form 40 to 120 cpm – speeds depending on materials and application. Cap size range: 11mm – 38mm, container size range: 3mm – 89mm in Diameter x 30mm – 241mm in Height can run standard pilfer proof, lined serum, tear off / flip off 1 – 3 piece closures, solid aluminum caps, as well as special closures (with proper change parts). Equipped with vibratory cap hopper, 12 pocket rotary container handling wheel, 3 spinning roller sealing system, 64" Long x 2-1/4" Wide stainless steel mesh belt conveyor. Control panel with on / off switch, e-stop conveyor and bin speed control dials, cap detector, product counter with readout and hour meter, mounted on (4) base with locking casters. Automatic, aluminum cap sealer rated from 200 to 600 cpm – speeds depending on materials and application. Cap size range: 11mm to 32mm. Container size range: 0.5" to – 2-1/4" in Diameter x 1-1/4" to 6-1/4" in Height with 1 to 250 cc capacity and can handle all standard serum seal style closures (with proper change parts). Equipped with vibratory cap hopper, rotary container handling wheel, 118" long x 2-1/4" wide stainless steel mesh conveyor belt, three spinning roller sealing, seal force detection of cap and reject of vials that dont meet the seal force requirements. Control panel with on / off switch, e-stop, reset, auto, jog and jog forward / reverse controls, machine / hopper speed dials, cap detector and reject, product counter with readout and hour meter, mounted on stainless steel base frame. Aluminum " Flip Off " fitment capper capable of speed from 40 to 120 cpm – speeds depending on materials and application. Cap size range of : 11mm – 38mm, and a container size range of : 13mm – 203mm, 36" L x 2 1/4" W S/S mesh product conveyor belt, with 36" infeed / discharge height, has a 12 pocket rotary star wheel product handling, vibratory cap hopper and cap chute, and is currently set for 20mm cap. West Model PW500F, aluminum flip off fitment capper rated from 40 to 120 containers per minute – depending on number of pockets, materials and application. Cap size range:11mm to 38mm, container size range: 3mm to 89mm diameter x 30mm to 203mm high, can run flip or tear off and solid ROPP aluminum caps (with proper change parts). Equipped with 12 pocket rotary container handling wheel, 3 spinning roller sealing system, 32" Long x 2-1/4" Wide mesh belt container conveyor, turning disk cap hopper, on / off, e-stop buttons and speed control dial. Mounted on (4) leg base frame. 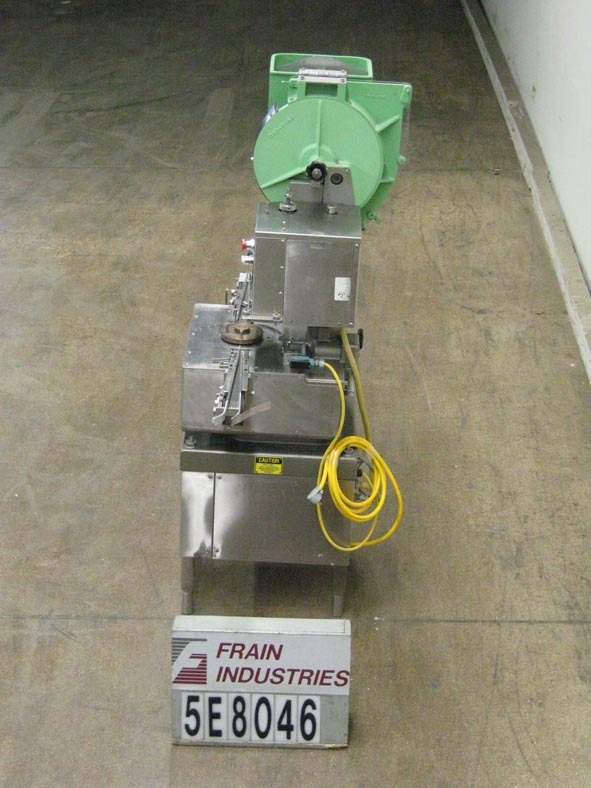 Automatic, aluminum fitment capper capable of speed from40 to 120 cpm – speeds depending on container and cap size. Cap size range of : 11mm – 28mm, and a container size range of : 13mm – 89mm dia x 30mm – 203mm H (8) pocket and 13mm – 54mm dia x 30mm- 203mm H (12) pocket, has 16" L x 2 1/4" W, S/S mesh product infeed / discharge conveyors with 36" infeed / discharge height, currently set with 12 pocket rotary star wheel product handling and has a mechanical hopper and cap chute.